Customers love rewards as it builds a psychological effect on their behavior converting them to being loyal to a brand. Based on this theory, loyalty programs leaped back in the 19th century. It helped many brands to realize the real value of repeat business. Rewards points/loyalty points create a win-win situation for both the consumers as well as the company. As per Mckinsey, US companies spend 50 billion dollars a year on loyalty programs alone, and it also noted that loyalty programs have the potential to generate as much as 20 percent of a company’s profits. Companies such as financial firms, consumer goods, e-commerce, or retail have been very innovative with loyalty programs, yet they have not been able to succeed in this venture completely. This is where a decentralized and collaborated loyalty engine built on Blockchain technology can be a brilliant way to impact a business bottom line. It is an innovative use of Blockchain technology to bring in multiple brands together to offer a wide range of products to consumers in order to redeem their reward points. While customers appreciate being rewarded loyalty points, they also value flexibility with redemption. One of the primary problems with most of the loyalty programs is its stringent redemption process. Businesses have their own reward programs and points earned can only be redeemed with the same business. For instance, it is not very often for a customer to book flight tickets. Moreover, the points earned from the transactions are not enough and expire before they are used; hence many customers consider these programs useless. This is where Blockchain comes in as a solution. It allows businesses to trade through a loyalty engine with each other in a decentralized and trustless open protocol system. What is a Loyalty Engine? It is a plug & playable Blockchain based solution with capabilities to create closed groups (Loyalty Permissioned Network) of partners and customers with a sharing of earn & burn system. It is an easily configurable solution that can be used by multiple brands and customers individually. How does a Loyalty Engine work? Loyalty engine creates a platform for various brands and customers to collaborate and share their loyalty points across the partner/vendors who have signed up for the program, ultimately allowing customers to redeem reward points across brands. Blockchain helps to put all the reward earnings of a consumer to a decentralized ledger on the blockchain that can be created by any vendor who wishes to enroll a consumer in the loyalty engine or by the consumers themselves using the DApp. Customers would then be on-boarded to the engine by providing simple details like name, email and mobile number of the customer in the APIs between the Loyalty Engine & the Partners. Whenever a consumer will transact with a brand to purchase an item, a fraction of the purchase in the form of loyalty points calculated basis a conversion rate pre-decided by the partners will get credited to customer’s blockchain account. This happens via API gateways exposed by the vendor’s blockchain node and a transaction will get recorded on the blockchain. The blockchain will act as a decentralized ledger for all the rewards and loyalty points collected by the consumers through various vendors/businesses. For example:- If 2 travel portals sign up on loyalty engine and consumer earns loyalty points for booking tickets, then he/she will be able to redeem those points on either of the portals. What is an earn rate? Earn rate is the percentage decided by the partner that a consumer earns with respect to the purchases he makes with the partner. This workflow explains how loyalty points are earned from various vendors and recorded in a decentralized account on the blockchain. Similarly, the loyalty points earned by a consumer through various vendors/ businesses can also be easily redeemed with any of the partners as per the burn rate decided by the partners. Burn rate is the pre-decided value that can be redeemed by the consumer in terms of actual money. 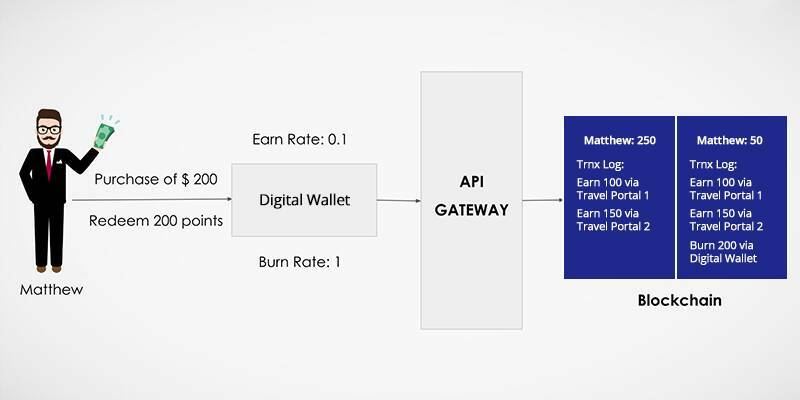 The burn workflow explains how the loyalty points are redeemed by a consumer and debited directly from the decentralized account on the blockchain which is a part of the loyalty engine created with the help of blockchain. The Loyalty Engine would enable partners to collaborate such that the customer of these businesses is being able to earn and burn loyalty points as and when they avail any services or buy products across any the network of loyalty engine. The engine uses Hyperledger Fabric that will be used to set up a business network between different partners. Each of these partners would need to install a peer to become a part of the network. Following which there would be separate profiles created and maintained for each partner. Partners would then be able to login to the Dapp to view their dashboard and profile information. The Loyalty Engine will have an API Doc and would expose APIs that partners could use to push and retrieve data from the engine. Blockchain acts as a decentralized completely transparent ledger which is distributed among various nodes which helps in recording and validation of transactions recorded. Hence to keep the transactions discrete “Hyperledger Fabric” was created so that the transaction can be done in a confidential manner. Loyalty engine uses API gateways to validate the consumer’s information from the partners/vendors, and the hyperledger fabric helps in securing that information. Dapp is used to enrolling consumers to the loyalty engine. They can be enrolled by Vendor/Partner, Admin, via transaction APIs provided by loyalty engine, or they can enroll themselves to start using the loyalty engine in order to earn loyalty points and redeem them. All the information related to users and partners and loyalty points are kept in the Hyperledger Fabric created for the loyalty engine to keep the information private and also assures the safety of the partners and the consumers. After which the data is encrypted within the Hyperledger Fabric and is recorded in the blockchain. Different modules are coded within Hyperledger Fabric using smart contract. The data stored in the blockchain can be manipulated by means of these smart contracts. 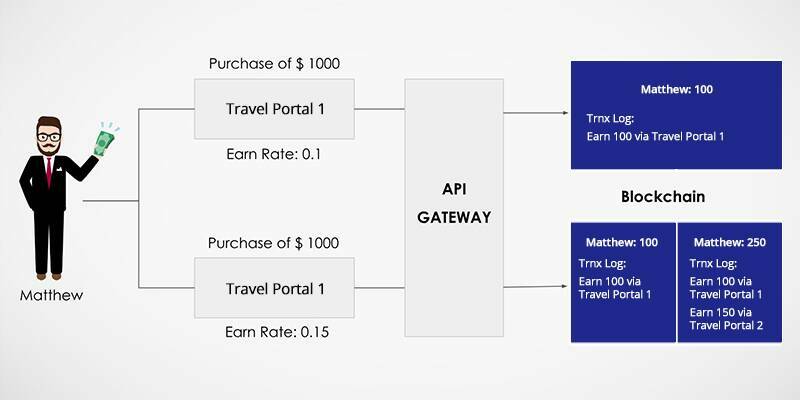 Access to different modules are provided by means of API Gateway/ DApp. The partners can have controlled access to the blockchain via the API Gateway using their specific nodes and their cryptographic identities, thus keeping the data secure. Customers/ Partners can login to the DApp to view various dashboards and account information. The cryptographic network identities can be managed via network cards, which can be generated by the network admin. Each card defines the authorization and access profile of the cardholder. Different access can be granted and revoked by the network admin. The cards are required to be installed on the partner’s client machines which runs the rest server to access the API Gateway. Loyalty programs are always beneficial to businesses as they help in attracting more buyers and retaining customers but implementation is where most of the businesses fail as creating loyalty programs is expensive and difficult to maintain, and are not utilized to their full extent. Blockchain when combined with loyalty engine can help bring customer delight, helps in retaining new customers as well as providing benefits to returning customers. It also helps to increase the consumer base and increasing revenue while saving cost and increasing security & transparency.